Today my home is being featured at The Cottage Market, which is a delightful blog chock full of home decorating eye candy. Andrea is a sweet soul who features a different cottage style home every week and also includes posts about junk finds and other wonderful cottage type stuff. Even her logo is cute! Head on over to The Cottage Market and see the tour of my home that Andrea put together. Even though it’s summer, she included a few photos of my Christmas decor – including my tree that I tirelessly worked on to get it just right! 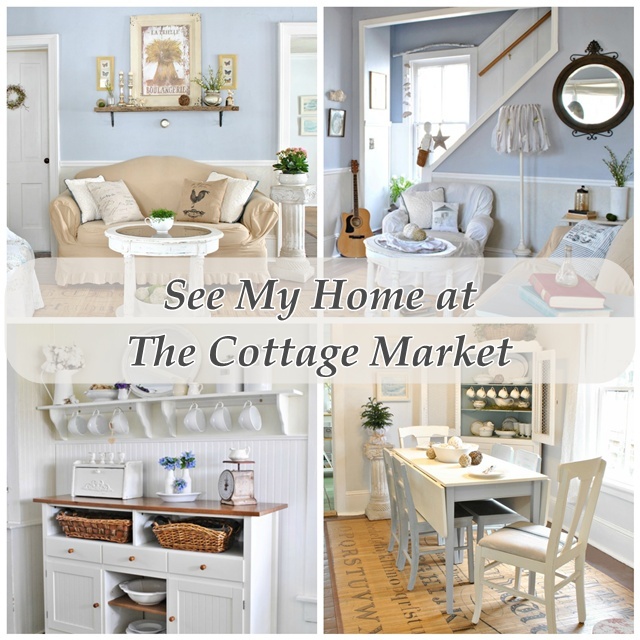 See my home tour at The Cottage Market! Good Afternoon Jennifer, How lovely to have your home featured on another blog…. I am not surprised though, as your home is lovely. I am going to pop over to visit Andrea as I must have missed your Christmas decorating post. I love decorating for Christmas, so I am looking forward to seeing your posts. Your home looks fabulous! The outside is just as charming as the inside. How fun to be featured…. Bravo!